On their fifth studio outing, Punch Brothers sound more assured in their identity than ever -- which isn't necessarily a good thing. Punch Brothers are aptly named. The genre-unconcerned acoustic quintet, initially formed in 2006 as the band for lead vocalist and mandolinist Chris Thile's solo LP How to Grow a Woman from the Ground, debuted with 2008's Punch, which foreshadowed the sozzled songwriting techniques that define the group's best work. No track is this more explicitly audible than "Punch Bowl", which opens with a high-register lick that gives way to dissonant interplay between the band members in the verses, over which Thile sings, "Baby's at the punch bowl / With a glass for you to fill." The main refrain of the song, a witty capture of the drunkard's incomplete thought ("I'm just sayin'…. / I'm just sayin'…. ), climaxes with a recapitulation of the main riff. When this happens, the riff attempts to serve as an anchor for the swirling music that came before it, but inevitably the song drifts back into the fog of another drink. The battle of order and disorder that drives "Punch" concludes with the band landing on every note except the right one. A whole mess of complicated, beautiful, and brilliant music follows "Punch Bowl" on Punch, but before any of that can happen the listener is left reeling, like she's just put down her third and is signaling the bartender for another. Although often pigeonholed as a bluegrass outfit for the connotations evoked by their instrumental lineup – guitar, fiddle, mandolin, banjo, upright bass – Punch Brothers have never staked their claim in any generic territory, preferring to let the music go where it often unpredictably goes. (One of this reviewer's favorites: check how Antifogmatic's "Next to the Trash" somehow seamlessly segues from folksy waltz to pop/rock strums to pirate ship jam in a single minute.) This disregard for convention, seen as showboating by purists, enabled this quick-minded troupe to put out some of the finest recordings of this century so far – chiefly among them, 2012's Who's Feeling Young Now?, which bristles with creative energy from start to finish. And if it is often difficult to anticipate where these guys go over the course of a single album – or, for that matter, a single track – the artistic trope of alcohol, in its many iterations, causes, and effects, provides a throughline. 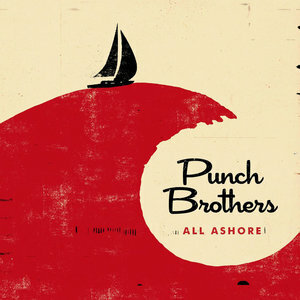 All Ashore, Punch Brothers' fifth LP and first as self-producers, name-checks a cocktail right away on its track listing. It comes not from the world of whiskey, where Old Fashioneds and Juleps remain popular favorites, nor from the antiquarian recipe books which map out concoctions like antifogmatics or party punches. (The liquid mentioned in "Punch Bowl", one can infer, comes more from early 20th-century drawing rooms than it does the grain alcohol-doused, neon creations that populate college dorm rooms and things called "ragers".) With All Ashore, the band takes a tropical direction. Its third track, "Three Dots and a Dash", is a tiki-type cocktail created during World War II, whose name signifies the three cherries (dots) and a chunk of pineapple (dash) which serve as garnish. Although the track is an instrumental, its name appropriately characterizes the pace and mood of All Ashore, which is easily Punch Brothers' calmest and most introspective release to date. One can easily imagine listening to the nine songs that make up this album in a sun-baked cabana, a rum cocktail in hand, skewers that once held pieces of fruit discarded on the table. Promotional materials for All Ashore and certain Tweets of Thile's confirm that tropical cocktails will be more than just an artistic device for the quintet's upcoming tour for the album. So what do the "Three Dots and a Dash" tell us about this music? One can immediately hear a contrast between All Ashore and its predecessors by its high-volume, high-tempo moments, which largely are few. Gone is the apocalyptic tumult of The Phosphorescent Blues' "Boll Weevil" or the raucous barn-burning of the Who's Feeling Young Now? jaunt "Flippen (The Flip)". All Ashore has "Jumbo", a pointed satire of a politician who in no way occupies the highest office in the United States at the moment, and the groovy riff that concludes "The Angel of Doubt", a track on which Thile basically raps and, impressively, gets away with it. "Jungle Bird", an unshowy yet dexterous display of the group's instrumental prowess, ranks as the most upbeat tune here, with its zip-fast instrumentation evoking the image of the titular creature weaving its way in and out of a vibrantly colored thicket of equatorial foliage. Here fiddle player Gabe Witcher and banjoist Noam Pikelny shine, with the latter's quick bowing delightfully contrasting with the former's sharp plucks: the sound of a dozen jungle critters chirping in a miniature symphony. Punch Brothers can claim many inventive lyrical achievements this far into their discography, but few things attest to their musical craft like their ability to conjure up the technicolor tropics without ever singing a word. But while those three songs stand out, they are also the least representative of All Ashore as a whole. The title cut provides a clearer indication: beginning with an earworm of a banjo figure, the song is then joined by Thile and guitarist Chris Elderidge, who pick rapidly on the upper strings of their instruments, which is then juxtaposed with long notes on Witcher's fiddle and Paul Kowert's deep bass. The five instruments perform in half-conjunction: it seems like they're arriving at something like a central melody or chord progression, but they never quite get there. That is, until just past the first minute, when a strident and rhythmically tricky chord progression by Elderidge, accented by Kowert's bass and punctuated by palmed strums on Thile's mandolin, builds tension that seems to demand release: a big chorus, perhaps, or some other kind of climactic moment. But it never comes. Right when the song leaves an opening for a crescendo, it calms down: Kowert and Elderidge's rhythmic backing gives away, and just Pikelny's banjo, Thile's mandolin, and harmony vocals deliver the chorus. Past album openers like "Familiarity" (The Phosphorescent Blues) and "You Are" (Antifogmatic) adopt the strategy of building to a big moment, be it a lush chorus of Beach Boys-esque vocals (the former) or a rollicking pre-chorus befitting a rock band (the latter). The clearest antecedent to "All Ashore", the Punch Brothers classic "Movement and Location", similarly uses the guitar/bass rhythm strategy, but does so while sustaining tension until the very last second of the song, when all the instruments abruptly stop. The force of that stop hits like an uppercut. The quietly played instruments and hushed vocals in the final stretch of "All Ashore" close the song like a head falling to a pillow for a night's rest, a strange move for an opening tune. This compositional decision tracks with the lyrical matter of "All Ashore", which Thile describes as "a meditation on committed relationships in the present day, particularly in light of the current unsettled political climate". He sings of two parents, a dad who "burns like a meteor / through a night of his own diversions / hoping to blaze half a second of a glowing trail", and a mom who "cuts like a man-of-war / through the fog of an early morning / With nothing more than a coffee filling up her sails." The movement of the mother and father, represented by Kowert and Elderidge's rhythmic patterns, is met with the pensive and relaxed speed of the banjo, the aural equivalent of the song's key directive: "Singing all ashore that's going ashore" -- in non-seafaring terms, shove down that incessant compulsion to work and come back to earth. These are poignant ruminations, and the same can be said for most of the tracks on All Ashore, which contains some of the most literary of Punch Brothers' lyrics to date. And like "Jumbo", whose old-timey, carnivalesque delivery fits its portrait of a "privileged" politician "skin white as new corn liquor hair black as molasses rum", "All Ashore" matches its music to its lyrics, each reinforcing the other. Lyrics do not incidentally adhere themselves to separately composed music with Punch Brothers. Yet even as "All Ashore" achieves this musical/lyrical synergy, it also signals a mid-tempo streak that runs through the rest of the LP. Some bursts of activity excepted, the pace of All Ashore is that of a relaxing stroll on a beachfront promenade. The first two-thirds of "The Angel of Doubt", prior to its beat-drop of an outro, take a steady pace toward its conclusion, as does "Look at this Mess". "Like It's Going Out of Style" wraps up the record quietly, the instruments at half-volume and the vocals often in an airy falsetto. The plaintive "Gardener" follows the jig-like cadence of Thile's vocal on "Jumbo" with the atmosphere of a lullaby. In all of these moments, the motif of the tropical cocktail holds true: All Ashore is a call to savor, to pay attention, to step back from the hustle and bustle and remember the importance of being calm. These virtues are not just valuable aides in a time of political tumult, when the Jumbos of the world tell themselves, as Thile sings on "It's All Part of a Plan", "Look I'm a God more than a man now." These virtues, if one is willing to read an ethos into a mixed drink, imbue the spirit of the Three Dots and a Dash, the Mai Tais, and their ilk. Some might see tropical drinks as a totem for escape from the real world, an interpretation to which the existence of restaurants like Jimmy Buffett's Margaritaville would afford some legitimacy. For Punch Brothers, however, a well-made tropical cocktail is not an escape but a re-orientation toward the important things in life: love, beauty, companionship. Going to the beach, and living well, is made better by those three things after all. But even as this lyrical and conceptual vision remains compelling throughout All Ashore, it manifests less immediately in the music itself, which lacks the dynamism that animates Who's Feeling Young Now? and The Phosphorescent Blues before it. It's refreshing to hear the unashamedly positive vision like the one at the heart of "Like It's Going Out of Style": "We all lose faith / But miss it when it's gone and love, it's always gonna come back around / So miss it like it's going out of style." But the languid music behind it feels too on the nose when previous Punch Brothers outings reveal these five musicians to have an endless bag of tricks. Put simply; it feels like there are a lot fewer tricks this time around. A revealing quotation from the All Ashore press release indicates an explanation for this change of pace, beyond the tiki cocktail spirit. In describing the record, Witcher said, "This record is a distillation the things that only we can do… We wanted to focus on the things that make us unique, and I think we did. And we have a more cohesive and successful record. We've been around for 12 years now; we know who we are." That final clause tells all. What All Ashore lacks is Punch's throw-everything-at-the-wall audacity, and the song-to-song experimentation of Antifogmatic, Who's Feeling Young Now?, and The Phosphorescent Blues. On those three records, the songs leapt from genre to genre, from pop structures to classical ones: hear how The Phosphorescent Blues follows up a Debussy arrangement with a radio-friendly pop number and a rock tune with clear debts to the Strokes, a favorite of these Brothers. Witcher wasn't wrong to say that All Ashore exhibits the unique style of the band. The ingenuity and passion of these five musicians are never in question. But All Ashore is the first Punch Brothers record to feel the most lived-in, the most settled on what the band is and what it represents. Musically it illustrates the classic distinction between the thrill of the chase and the melancholy of finally getting what you were chasing: there's an argument to be made that it's more enlivening to hear a band pursue its identity -- perhaps even multiple possible identities -- than it is to hear it land on one finally. What makes albums like Who's Feeling Young Now? feel so vivacious is their indeterminacy, their sense that things can change at any given moment -- in other words, questions of identity remain up in the air. Certain things remain constant – instrumental virtuosity, an entirely acoustic instrumental lineup, a fungible conception of genre – but otherwise, it's all variables. Some can find this borderlessness unsettling, maybe even unsatisfying: shouldn't a band decide what it is, eventually? It's a reasonable question, and even more than that, it's understandable for both musicians and their fans to derive contentment from the feeling of having arrived at a point of clarity. Yet for their entire existence as a band, Punch Brothers reveled in uncertainty, so much so that it appeared as if it was their identity. But with All Ashore, things are different for Punch Brothers. They know who they are now.